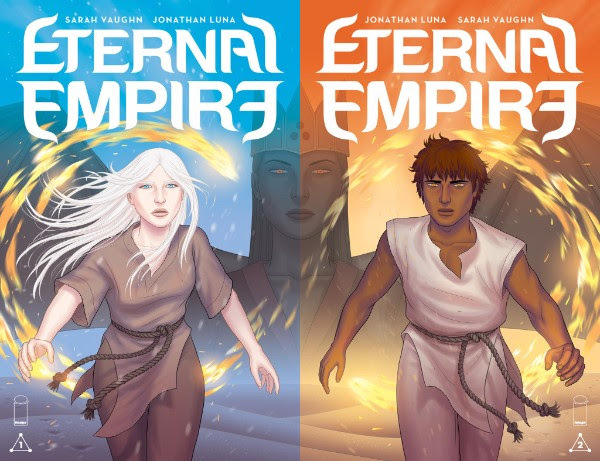 Powerhouse creative team Jonathan Luna (ALEX + ADA, THE SWORD, Spider-Woman: Origin) and Sarah Vaughn (ALEX + ADA, Deadman: Dark Mansion of Forbidden Love, Ruined) return with the monthly epic fantasy series ETERNAL EMPIRE, coming this May from Image Comics. The Eternal Empress has waged war against the countries of Saia for over one hundred years, and now her sights are set on the last country left standing. Within the brutal Empire’s workforce, a young woman receives strange visions that give her the courage to escape her fate...or run straight toward it. ETERNAL EMPIRE #1 arrives in comic book stores on Wednesday, May 3rd.